Imagine the giddy laughter heard from kids picking and eating their way through an open farm field covered with fresh, ripe strawberries. Pure joy. This week our new food adventure takes us to a coastal farm where you can pick your own strawberries. Our new food adventure took on a different flavor this week. We were traveling, so cooking wasn’t top on our list. But we found a new food inspiration at a local farm. 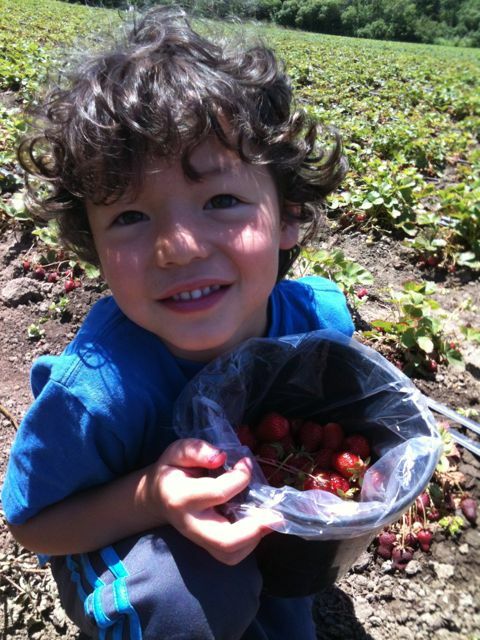 Nestled in a sun-drenched field along the California coast, my kids discovered the joy of picking your own strawberries. 1) Find a local pick-your-own farm. Pick Your Own is a great resource for finding farms in your area, as well as what’s in season. 2) Choose organic. Seek out farms that are certified organic. When grown conventionally, strawberries are considered part of the dirty dozen, which means they can be laden with pesticides. 3) Bring two pails. One for perfectly ripe fruit, the other for just-past-ripe fruit. Farmers will often give you the just-past-ripe fruit for free (as they did in our case this week), and the fruit is perfect for making jam! 4) Save a portion of your bounty for freezing. You’ll appreciate those sweet summer berries in smoothies when the winter blues hit. 5) Use your just-past-ripe strawberries to make jam. The Naptime Chef has a wonderfully easy and tasty recipe for Strawberry Vanilla Jam – yum! 6) Enjoy with friends. Upon returning to our hotel, the resident chef was kind enough to wash and prepare the several pounds of berries that we picked. The most fun part: enjoying an overflowing bowl of fresh local strawberries, and the stories of our adventure, with friends and family. Jennifer Tyler Lee is a mom of two children and the creator of Crunch a Color™ -- the award-winning game that makes healthy eating fun. Like most parents, she struggled to get her kids to eat healthy, balanced meals, so she decided to make it into a healthy eating game. Watch her picky eaters tell the story of how they turned into healthy eaters playing the game. Follow @crunchacolor on Facebook , Twitter and Pinterest to tune into Crunch a Color's healthy eating adventure and Jennifer’s tips and kid-friendly, easy recipes. Crunch a Color is a proud supporter of non-profit children’s nutrition programs including Jamie Oliver’s Food Revolution and FoodCorps. Available online at www.crunchacolor.com and in stores nationwide at Pottery Barn Kids.